We know a little bit, but not much, about the linear algebraic properties of magic squares. Here is my favorite experiment involving the linear algebraic properties of magic squares. Recall that the rank of a matrix is the number of linearly independent rows or columns. If an n -by- n matrix has full rank, that is rank equal to n, then it is nonsingular and has an inverse. Let's look at the rank of the magic squares generated by MATLAB. We can clearly see three different cases. Odd order magic squares have full rank, singly even order magic squares have rank equal to roughly half their order, and doubly even order magic squares of any order have rank equal to three. Why is that? It reflects the three different cases in the MATLAB magic square generator. Recall from last week that we have two different ways of generating the odd order magic square produced by magic(n). De La Loubere's method generates the matrix elements one-by-one along broken diagonals in a manner that seems very unlikely to generate linear dependence between rows or columns. Our new algorithm generates the same magic square with a few array operations. It is not hard to prove that A and B have full rank and so it is likely that their sum has full rank as well. There are many other magic squares besides the ones generated by MATLAB. Are all the odd ordered ones nonsingular? Frankly, I have no idea. The magic square property tells us very little about linear independence. Does anybody know of a 5-by-5 magic square that is also a singular matrix? I would love to see it. Or, can anybody prove that odd-ordered magic squares must be nonsingular? I would love to see a proof as well. Actually, I better see just one or the other. For doubly even order, the rank is always three. When I first saw that -- years ago -- I was really surprised. For a long time I had a vague idea that the rank could be explained by the simple algorithm that generates these matrices. But now I'm not so sure. Let's look at the generation of magic(4). Start with the integers 1:16 arranged in a 4-by-4 array. This, of course, is a matrix with rank 1, but we're about to alter it drastically. Mark half of the elements with an asterisk in a pattern like this. Now regard the marked elements as a one-dimensional array and flip that array end-for-end. This produces magic(4). It must be easy to describe that indexing operation in matrix terms in a way that generalizes to higher order and explains why the resulting matrix happens to have rank 3. But I don't see how today. The bar chart above shows that the rank for singly even magic squares, where n is divisible by two but not by four, is about $n/2$. Actually, the rank is $n/2+2$, and it is not hard to see why. The first step of the singly even algorithm is to stack together four copies of the square of odd order $n/2$. This M has equal column sums, but not equal row sums. And, since A has rank $n/2$, this M has rank $n/2+1$ The next step interchanges some blocks of elements to correct the row sums. It turns out that this step does not change the rank. Now this M has equal row and column sums, but its diagonal sums are not quite right. The final step swaps two pairs of elements to correct the diagonal. This is a rank one change that produces the final magic square and increases the rank to $n/2+2$. William H. Press, Did Dürer Intentionally Show Only His Second-Best Magic Square?, 2009. CBM, Magic Squares chapter of Experiments with MATLAB, 2011. That's a really interesting pattern! One minor point in the Doubly Even Order case - the rank of the initial 1:16 matrix is 2, not 1. Try: rank(reshape(1:16,4,4)) In fact, for any N>1, reshape(1:N^2,N,N) will have rank 2. 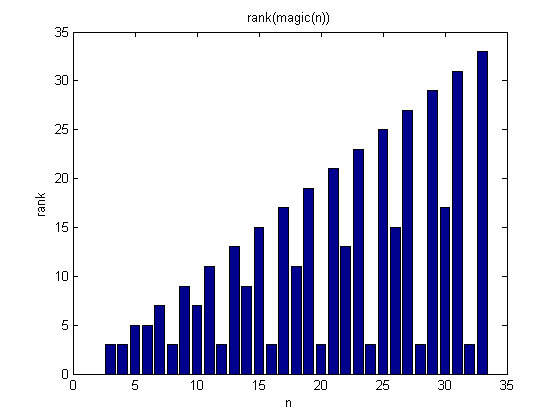 So it seems that the rearranging operation to create the magic square always increases the rank by 1. A quick search via Google reveals this link ("http://www.google.com/url?sa=t&rct=j&q=&esrc=s&source=web&cd=6&cad=rja&ved=0CFUQFjAF&url=http%3A%2F%2Fciteseerx.ist.psu.edu%2Fviewdoc%2Fdownload%3Fdoi%3D10.1.1.88.2717%26rep%3Drep1%26type%3Dpdf&ei=xMGjUJaJEeaVyAGN7YGQCg&usg=AFQjCNG8fLTdq8Hdxe3BC6VDfaNbXL0aAw&sig2=wtN5LgeLXduT7u_VqxWcRw") in which the following singular 5-by-5 matrix is shown. 2 11 21 23 8 16 14 7 6 22 25 17 13 9 1 4 20 19 12 10 18 3 5 15 24 This paper references another whose authors have found 656 singular magic squares of order 5.